Communicating vehicles could zip through intersections more efficiently, but would they be hackable? Traffic-light-free transportation design, if it ever arrives, could allow twice as much traffic to use the roads, according to a newly published open-access study in PLoS One co-authored by MIT researchers. The idea is based on future vehicles equipped with the kind of sensors used in autonomous vehicles and that communicate wirelessly with each other, rather than grinding to a halt at traffic lights. The researchers created a mathematical model based on a scenario in which high-tech vehicles use sensors to remain at a safe distance from each other as they move through a four-way intersection. By removing the waits caused by traffic lights, these new “Slot-based Intersections” (SIs) speed up traffic flow in the model. The greater capacity of the system, notes Paolo Santi, a researcher in the MIT SENSEable City Lab (a member of the Italian National Research Council and a co-author of the study), does not stem from vehicles moving more quickly. Rather, it comes from creating a more consistent flow at an optimal middle speed, at which automobiles can keep moving. “You want the car to use the intersection for the shortest possible time,” Santi says. Such a system would also reduce pollution and save on gasoline. The authors noted that in many cities, intersections with lights are often placed relatively close to each other. 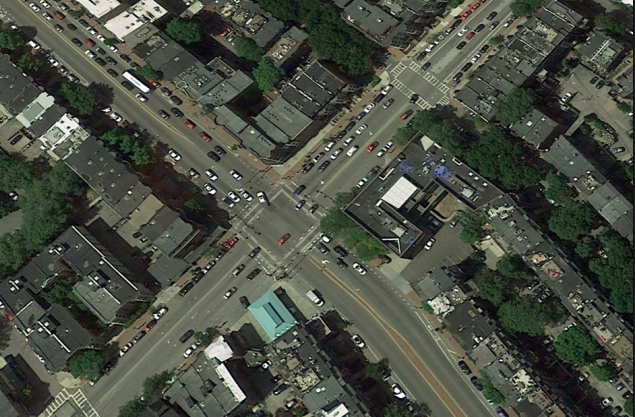 So how would the dynamics of traffic at one intersection propagate through a whole urban network of roads? They’re working on that. A previous study with the same idea, but based on driverless vehicles, was done at Virginia Tech Transportation Research (see “Driverless vehicles to zip at full speed through intersections“). So exactly how would this work? The authors suggest that vehicles might communicate with roadside infrastructure and other vehicles to produce better coordinated flows. The notion of a vehicle-to-vehicle (V2V) communication system has been studied fairly extensively (see “V2V: Department of Transportation’s new communication system helps cars avoid crashes by talking to each other” and “A 3,000-vehicle test of wireless crash-avoidance system“) but has been criticized as hackable.